It is normal to feel like withdrawing from life when you are in so much pain, however being around others, expressing your feelings, and discovering life can go on are some of the ways you can begin to heal. Allowing others to comfort you, understand, and just listen can help get you through this very difficult time. 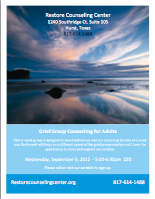 This 6 week group is designed to provide comfort and support as you go through the recovery process. We are here to help you grieve in a healthy way so that you can start to live again. To sign up or get more information please call Restore Counseling Center 817-614-1488 or fill in your name and email address below and we will get back to you.